Another day of garganeys being seen at Druridge for what appears to be most of the day by the massed ranks of retired Northumbrian birdwatchers. I arrive after work, no sign, despite staying until dusk. And it gets worse, Trevor Blake called me today and slipped into the conversation that he'd seen a male ring ouzel in front of the Budge screen...last Thursday!! Ring ouzel would've been a new bird for the patch for me. He did call me but I didn't answer. humph! I sometimes wonder what it would be like to have a patch where nobody else goes to. Living in blissful ignorance of anything you didn't find for yourself. It would be a lot more satisfying and a lot less stressful! I'll have to ask Stewart what its like! 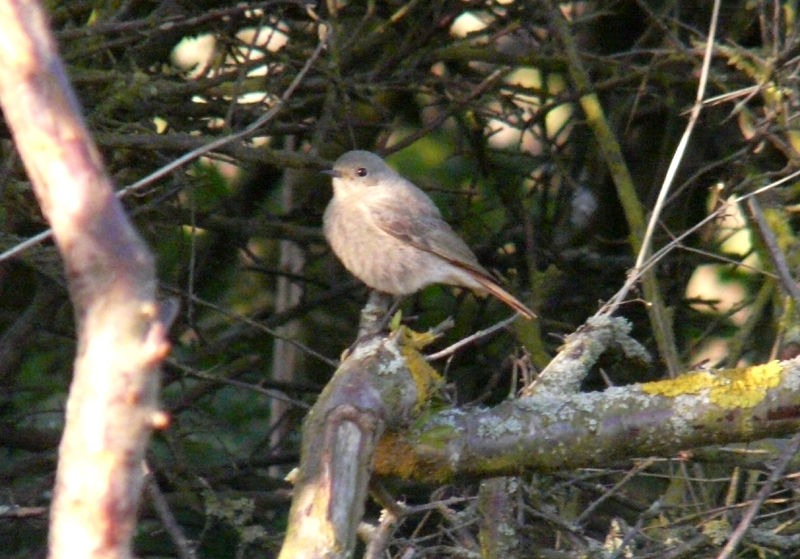 Anyhow, a black redstart was found this morning by some of the massed ranks of retired birders (I need a collective noun for these people - any thoughts?) in the 'Druridge Bushes' which made up for the disappearing garganeys. A crap photo, but the light wasn't good. I've not seen a black redstart on the patch since 2007 (although others have), the bushes were the last place I would have looked, they are normally to be found around the hamlet/entrance. That's me on 98 species for the year, will I break the ton tomorrow when I do my third mapping visit? The Garganey's are beating me 5 - 0at present, so you're not the only disappointed one. had two groups of reputables yesterday giving me two viewpoints (?? 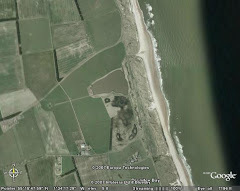 ), the BUdge and the South-facing Hide and zilch from both! I often wonder what I miss whilst at work Ipin :-) I'm Just glad there aren't any 'olduns' telling me about it! !